Asian style chicken fried rice. a favorite for these lazy, hot days when you need to be in and out of the kitchen but still dish out a wholesome meal. Boil the chicken in a pan of water with a teaspoon of salt, shred it and set aside. Using the same wok, pour in the sesame oil and the vegetable oil, then add the curry leaves(optional), grated ginger and garlic, sliced onions, turmeric, cook for 2-3 minutes on medium fire, leave until they turn golden and you get the fragrance of the ginger and garlic coming through. Once the mixture is cooked, add the shredded chicken and mix, make sure the fire is on medium heat, again leave it for 3 minutes(if you prefer the chicken to be crispy, leave it longer). Add the vegetables, the carrots first, followed by your preferred vegetables in this case diced leeks and spring onions. Add the Soya sauce. The diced vegetables won’t take long to cook as they are sliced thin, when done, gently pour in the beaten eggs, once it semi firms, stir, using a wooden spoon with quick movements until it scrambles, let the egg and vegetables cook for a few minutes, then add Salt to taste. 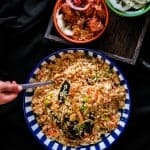 Once all the ingredients are cooked, add the rice, keep mixing until all components are incorporated, this is important if you want all the flavors to spread evenly, finally do a taste test, if you find there is a need for soya sauce or Salt just add a pinch and mix well. Serve with a Salad and a meat dish. Before you begin assembling this Asian style chicken fried rice, the rice and chicken has to be cooked and ready.